Interested in taking a trip to Hong Kong? Welcome to the Hong Kong Trip Guide! Have you ever wanted to go on vacation, but could never decide where you wanted to go? Maybe you’ve travelled to all of your favorite destinations several times, and now you’re looking for something new and exciting. Or maybe you just want a nice get away from home. At first glance it may be a little intimidating or scary to travel somewhere new. You may not know how to Speak Chinese, where to stay or what there is to do in Hong Kong. Don’t worry, you have come to the right place! Some of the most popular things to do in Hong Kong include walking down the Avenue of the Stars and witness the beautiful view of the Victoria Harbour. Then come back at night and see A Symphony of Lights. 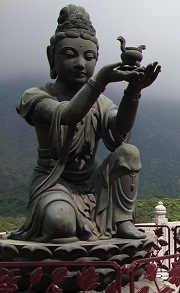 Travel in a Ngong Ping 360 Cable Cart to Ngong Ping Village to see the Po Lin Monastery and the Tian Tan Buddha. The tallest outdoor seated bronze Buddha in the world. One thing you might notice about Hong Kong is that the air pollution in a number of places is quite bad. If you are living in Hong Kong for the long-term, consider getting an air purifier. Go shopping for designer brand clothing and accessories or any electronic device you can think of at the malls and the street shops. Most of these items costing less than you can buy them for in your home country. Visit Disneyland or Ocean Park if you enjoy theme parks. Take a ride on The Peak Tram up to the top of The Victoria Peak mountain. While at the top of the mountain, take in the highest view of the city at the Sky Terrace 428. Snap some photos of the Victoria Harbour and the very unique architecture of The Peak Tower. And be sure to try the locally made Chinese Cuisine. 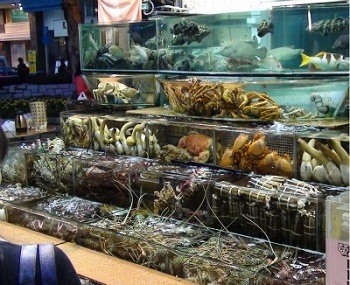 The Seafood is always fresh at the restaurants or any harbour in the city. If you enjoy eating Chinese food as much as I do, you may want to learn how to cook Chinese food Yourself. Make your visit more memorable by staying at an award winning 5 Star Hotels, save some extra spending money by finding a cheap Hong Kong hotels, or find the most suitable hotel for you with our Hong Kong hotel directory. From the scenic mountains, beaches and parks to the great shopping, attractions and giant buildings. This fast paced, densely populated city in the south coast of China has something for everyone. With all of these interesting activities, and some help from us, you’ll be able to travel Hong Kong like a pro in no time. And you never know, maybe you’ve just found your new favorite destination. The Hong Kong Travel Blog lets you know about new pages, additions, and changes on the HongKongTripGuide.com website. Subscribe today! Find Hong Kong News generated from Google News and Yahoo News. Stay up to date on what’s happening in Hong Kong! There are a lot of hotels in Hong Kong to choose from. Browse our list of Hong Kong hotels and see which one is the best choice for you. Wondering what there is to do in Hong Kong? Our list of Hong Kong Tourist Attractions can help you find the best things to see and do in the city. Hong Kong shopping opportunities can be found almost everywhere in the city. Learn why Hong Kong is considered to be one of the shopping capitals in the world. Looking for some information on Hong Kong shopping malls? Find out where the best shopping malls in the city are, how to get there, and much more! There are lots of Hong Kong events that occur throughout the year. Learn about some of these events and see if you can attend a few on your trip to Hong Kong. See our map of Hong Kong complete with information on all of the major territories in Hong Kong. Transportation in Hong Kong can be a little hectic and confusing at times. Make your trip to Hong Kong less stressful by finding out what kinds of transportation there are in the city. Information on the Hong Kong MTR railway system that spans all over Hong Kong. Ever wondered what Hong Kong food is like? See why Hong Kong is considered one of the best places to eat in the world. Wondering what a Hong Kong Drink is like? Learn about the beverages commonly consumed in Hong Kong. Learn about the popular Hong Kong street food sold all over the busy streets of Hong Kong. You may just find your new favorite snack! Here are some Chinese food recipes for anyone looking to eat something new, healthy and good tasting. Try some of these recipes yourself or submit your own for display on our website! Hong Kong Money has it’s own design and style which makes it unique to any other currency in the world. Find out what makes collecting Hong Kong banknotes and coins so interesting. The Octopus Card is a smart card used for making payments in Hong Kong. Find out what makes this card one of the most popular forms of payment in Hong Kong. Unsure about something in Hong Kong? Our Hong Kong Travel Tips can help you find answers to many questions you may have before or during your trip. Travelling to Hong Kong? Find out if there are any special Hong Kong Holidays taking place during your trip and make the best of any opportunities. Need to know what Hong Kong weather is like? We have information on what the weather is like for all 4 seasons in Hong Kong. Do you have an interesting Hong Kong Travel story? Share it with us and let the whole internet see! Click to see some useful travel links to travel related websites. Buy the Hong Kong Trip Guide eBook today! Bring all of our helpful Hong Kong travel information anywhere without the need for an internet connection!